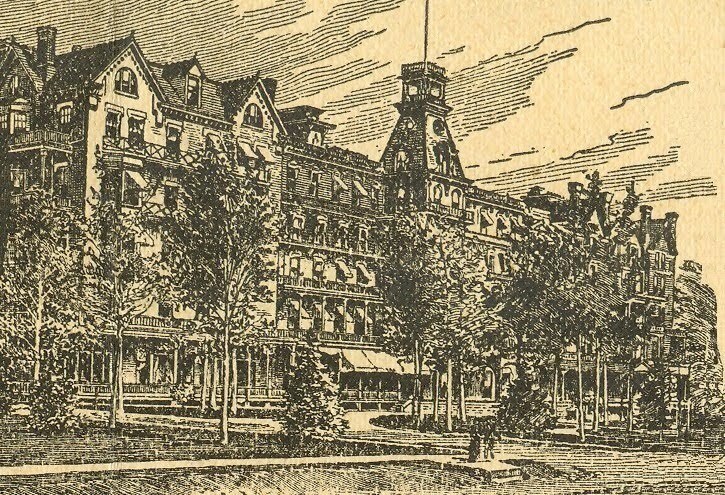 In 1876, Dr. John Harvey Kellogg became the medical superintendent of the small Seventh-Day Adventist sanitarium at Battle Creek called the Health Reform Institute. Renaming it the "Sanitarium," he expanded the facilities into one of the nation's leading health clinics. Specializing in helping those suffering from dyspepsia and severe indigestion, then called the "American disease," the Sanitarium rose to national prominence, expanding its facilities to accommodate about 650 patients by 1888. 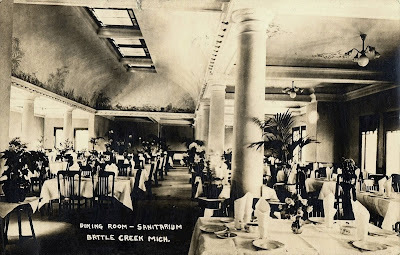 Kellogg also wrote prolifically about the principles of “biological living,” promoting his program for good health that became known as the "Battle Creek Idea." In that regard, his most lasting contributions revolved around the notion that good health stems from having a proper diet and getting enough exercise and rest. 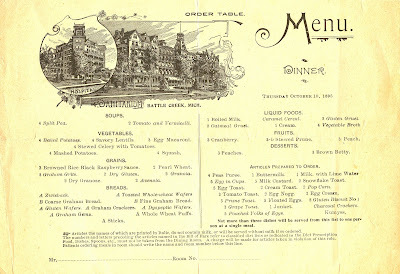 The vegetarian and whole grain diet at the Sanitarium was so monotonous that it prompted Kellogg to begin looking for new foods for his patients. In 1884, he invented a flaked-cereal from whole grains called "Granula," a name he later changed to "Granola." 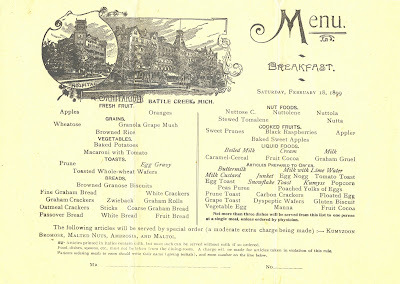 Briefly turning his attention to nuts (a change that can be seen on the three menus below by comparing the dishes on the bill of fare in 1895 to those in 1899), Kellogg eventually returned to cereals, developing the famous breakfast product called "corn flakes." Together with his brother, he established the Battle Creek Toasted Corn Flake Co. which evolved into the Kellogg Company. When the old Sanitarium burned down in 1902, the facility was quickly rebuilt and expanded. 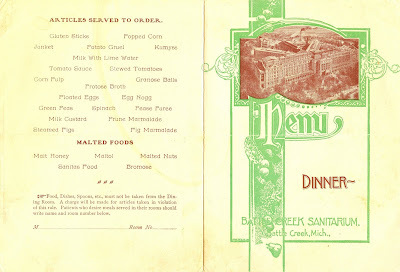 As shown on the cover of this menu from July 1903, it was now named the "Battle Creek Sanitarium," the small town in Michigan having become synonymous with the institution and its ideas. First, I wanted to thank you for posting this information. I teach people how to eat exercise and cook better for a lifetime of healthy living. I recently caught the movie "The Road To Wellness" (1994) on cable. This lead me to search for the possible menus from the "San". Looking over his menus, and knowing what he was supposed to be curing people from, there seems to be a high content of carbs and very little leafy greens. I would think this diet would be a short term cure, but long term exacerbate the very conditions he was trying to help. We now know that for a healthier diet, we must have about 50-70% of our intake from leafy greens, and other vegetables some fruits, 30% organic proteins, and the remaining be carbs and grains. 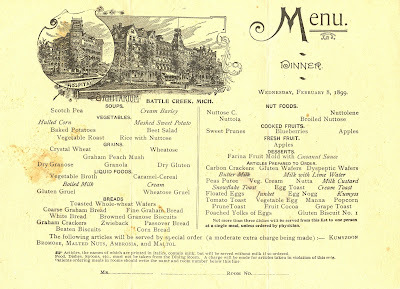 His menus seemed to be very rich in high glycemic index foods which would eventually kill a diabetic. In fact, due to the sedentary lifestyle of most modern humans, we should all probably be following a diet closer to that of a diabetic. The government guidelines of the "food pyramid" are completely wrong and based on very outdated information. We now know how our bodies identify and digest and use the food we eat and why it's so important to present it with the highest quality of food. Dr. Kellog was onto something when it came to diet and exercise, but the type of diet and the intensity of exercise actually needed I believe eluded him, mostly because of the primitive nature of medicine at that time. 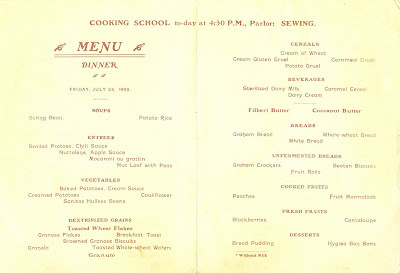 This was a delightful page and a good history lesson as to where we are in the USA dietetically, why we are where we are, and how much un-learing and re-learning we need to do.